Our new UV GlowBag Kits have UV lights that can be used independently of the light box, making them ideal for effective cleaning as well as hand hygiene demonstrations. Over the years we have sold thousands of our FSD Hand Hygiene Training Kits to the NHS and other medical care providers, government agencies, food businesses, schools, universities and infection control trainers. • No need for a mains power supply as it will also run off batteries. • Lamp can be removed to demonstrate effective cleaning and cross-contamination in the classroom. • No need for separate carry case - the case is the inspection cabinet. 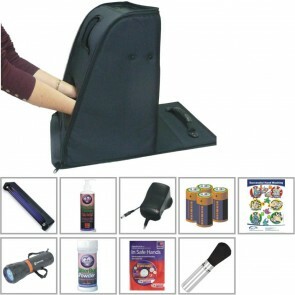 • A compartment in the base keeps accessories safe during transportation. As with our original kit, all you need to us the kit is open up the front of the case, switch on the lamp and it is ready to use.